Exclusive photo: Ralph Macchio Without His Hairpiece Toupee. Home → Damien Zone → Exclusive photo: Ralph Macchio Without His Hairpiece Toupee. 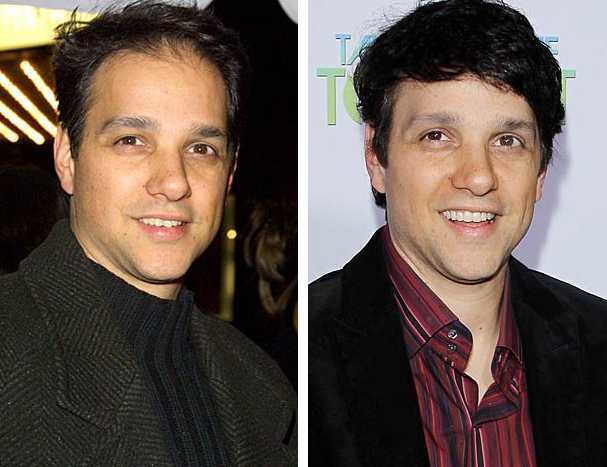 Ralph Macchio isn’t always dancing with the stars and he isn’t always wearing his toupee either. TheDamienZone caught Ralph without his frontal hairpeice on and asked him some questions. TDZ – We see you’re not wearing the front piece of your hair. Does it bother you that we took a picture of that? TDZ – The one you wear when you are on Dancing With The Stars. MACCHIO – I have no idea what you’re talking about. I just woke up. This is bed head. Top Ten RedBox Movies this week! Adam Scott loses his underwear at Masters . I didn’t know that Ralph wore a hairpiece but I actually think he looks handsomer without the hairpiece. Stella, I suggest you tell Ralph that because everyone’s agrees with you. Joe — Ralph’s head is too small for that wig — he needs a higher end stylist and he will look fine. You would not believe how many celebrities wear hairpieces – but you do not notice the good ones — he needs to spend more money and get a better stylist to craft it to his features.